At the confluence of two canyons in Colorado National Monument, the views of the valleys below, along with a winding hiking path, make for a great panorana photograph. This image consists of 4 photos stitched together - taken at the moment the sun sets behind the distant cliff - and shows the merging of Monument Canyon and Ute Canyon. This area located just off of the winding Rim Rock Road that runs 22+ miles through the park, which is located a few miles west of Grand Junction. 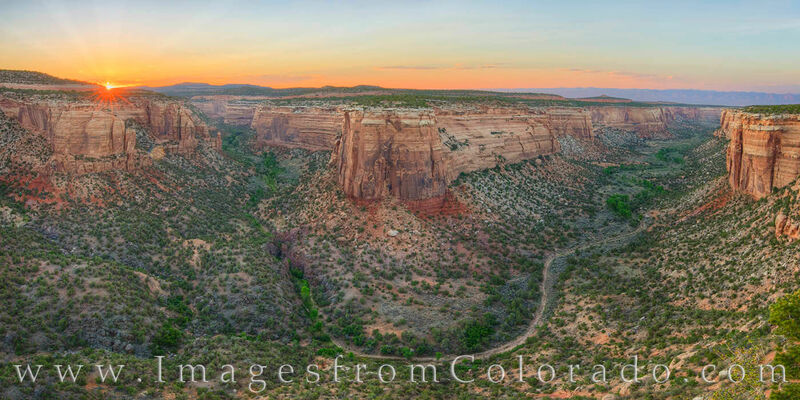 This panorama from Colorado National Monument is available in larger and custom sizes.